Darwin Lecture Theatre, Darwin Building, University College London, Gower Street, WC1E 6BT. Google Map | Campus Map | Route map from UCL entrances | Nearest tubes: Euston, Euston Sq, Warren St, Goodge St. 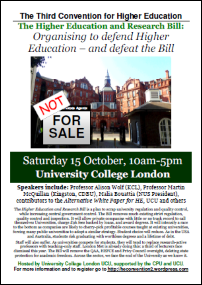 Confirmed speakers included: Professor Alison Wolf (Kings College London), Professor Martin McQuillan (Kingston, CDBU), Malia Bouattia (President, National Union of Students), Sorana Vieru (Vice President HE, NUS), Gordon Marsden MP (Labour Party shadow minister for HE), plus contributors to the Alternative White Paper for Higher Education, UCU and others. 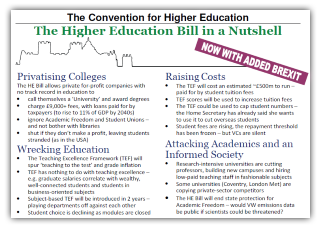 The aims of the Convention event are, first, to assess where we are in opposing the Higher Education and Research Bill as it currently progresses through Parliament, and second, to develop that campaign of opposition outwards. The purpose of this one-day conference is to plan the campaign to defeat the Bill. We are at a crossroads. We face a very serious structural threat to our sector, one that will impact on all our colleagues and students, and reshape the debate about the role of HE in society in the future. We share an urgent responsibility to educate and inform our colleagues, students and wider society; and to bring pressure to bear in Parliament from a well-informed public. On top of the HE Bill we now face a second attack on our sector. Government ministers have recently made statements about ‘listing’ foreign workers, reducing international student numbers, and even, bizarrely, insisting that ‘foreign’ academics will not be permitted to advise them on Brexit. This Convention was set up to defend our sector and stop the HE Bill. But we cannot ignore these political attacks on our institutions, our colleagues and our students. Knowledge knows no borders. Internationalism is core to what we do. We need to stand up for our sector. The Higher Education and Research Bill is a plan to scrap university regulation and quality control, while increasing central government control. The Bill removes much existing strict regulation, quality control and inspection. It will allow private companies with little or no track record to call themselves Universities, charge £9k fees backed by loans, and award degrees. It will intensify a race to the bottom as companies are likely to cherry-pick profitable courses taught at existing universities, forcing many public universities to adopt a similar strategy. Student choice will reduce. As in the USA and Australia, students risk graduating with worthless degrees and a lifetime of debt. Staff will also suffer. As universities compete for students, they will tend to replace research-active professors with teaching-only staff. London Met is already doing this: a third of lecturers face dismissal this year. The Bill will remove the QAA, HEFCE and Privy Council oversight, deleting state protection for academic freedom. Across the sector, we face the end of the University as we know it. You can register via EventBrite using the button below.